Water on the Bathroom Floor: An Emergency for a Plumber or Something Else? 11 Feb Water on the Bathroom Floor: An Emergency for a Plumber or Something Else? There are all types of plumbing leaks to be aware of. If your socks get soaked each time you step near the toilet in your bathroom, you may worry about leaks. Before you decide this is an emergency for a plumber, Sacramento’s Always Affordable Plumbing encourages you to get the facts. First, be sure that the water is truly coming from the toilet, because there are many things in a bathroom that can create small puddles. Shower doors or curtains may let small amounts of water out, especially as they open and close. Steamy air can condense on the ceiling or fixtures, then drip down to the floor. It can also condense on the outside of the toilet bowl and run down. To check for any of these problems, run the shower on hot for a few minutes, but don’t get in. Open the shower door or curtain a few times, then watch for runoff. If there is any, follow where it goes, because the solution to floor puddles may be as simple as being sure you tuck the curtain into the tub. You should also consider whether any males in the house need to improve their aim. Boys just learning to use the toilet often miss. Some older men are not much better. In other words, before worrying about water collecting on the floor near the toilet, be sure it is water. To discover if the toilet itself is leaking, you can add a few drops of food coloring or special dye tablets to the tank. Do not flush. Wait about half an hour, then look to see if colored water has leaked into the bowl or elsewhere. The dye can make otherwise clear water easy to spot, and it also can highlight thin cracks and loose seals. This is most effective for detecting slight leaks into the bowl itself, but it can also reveal other leaks. If no leaks are obvious, flush the toilet, then watch to see if colored water seeps from anywhere else. Other problems that may result in water leaking onto the floor include the shut-off valve or supply line. Water may also leak from beneath the toilet if there is a problem with the wax ring. Dyed water would not appear in any of these areas, but you may notice moisture or even beading water. Leaking parts should be replaced. 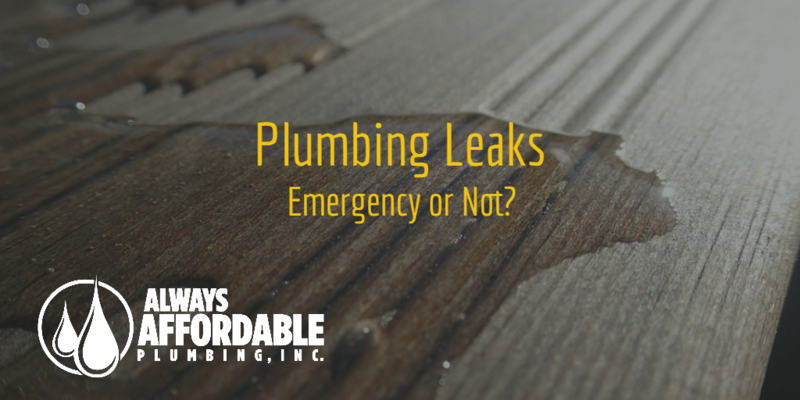 Still have questions about a possible leak? Not everyone likes dealing with toilets, but at Always Affordable Plumbing, that’s part of our job. We offer a FREE inspection for anyone who wants to make sure their toilet—and overall bathroom—is watertight where it needs to be.